If not otherwise specified, these resources are made available under a Creative Commons CC-BY-SA license (you can freely re-use and modify the material as long as you mention me as the original author and re-share the modified version). Topics in Human-Robot Interaction: social signal processing, face detection & recognition, emotion modelling & classification, RGBD vision for HRI. Mobile and Humanoid Mobile Robots (slides + source). Topics include Kalman filtering, Monte-Carlo localisation, path planning, Bipedal walking, Robot control. Introduction to Actuatores and Sensors (slides + source). Topics include DC motors, stepper motors, Arduino programming with ROS. 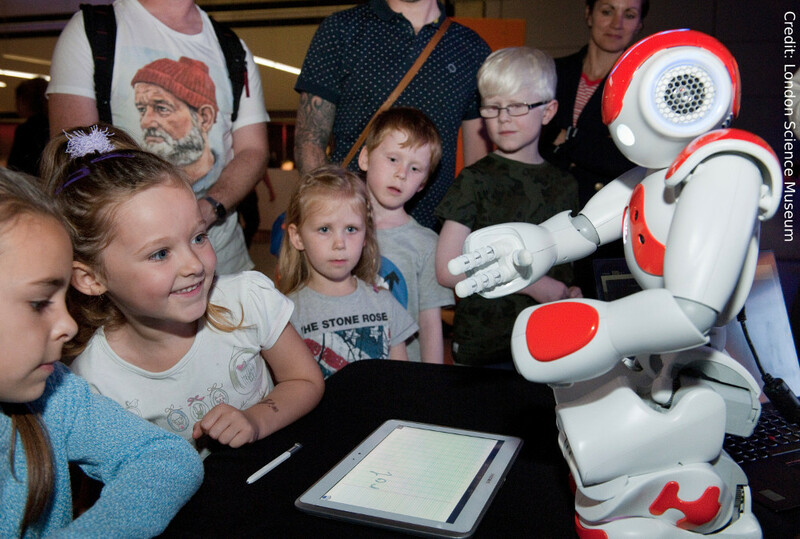 I enjoy explaning my research and discussing how robots and humans are going to live together, be it during public events (like on the right, at the London Science Museum in August 2015), on the radio or by teaching and supervising students. Don't hesistate to contact me!